The atlanto-occipital articulations function as bilaterally symmetrical ellipsoid synovial joints between C0 and C1. Occipital condyles and a superior articular facets of the atlas. Flexion is produced mainly by the action of the rectus capitis anterior. Limited by tectoral membrane. 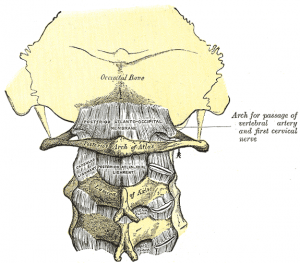 Extension by the rectus capitis posterior major and minor, assisted by the obliqus capitis superior, the semispinalis capitis, splenius capitis, sternocleidomastoid, and upper fibers of the trapezius. The rectus capitis lateralis are concerned in the lateral flexion, assisted by the trapezius, splenius capitis, semispinalis capitis, and the sternocleidomastoid of the same side, all acting together. ↑ 1.0 1.1 1.2 Orthopaedic Division of the Canadian Physiotherapy Association. 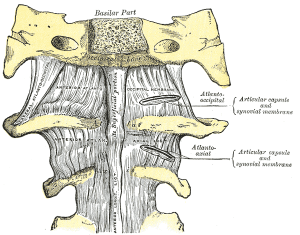 Biomechanics of the Atlanto-Occipital Joint. Clinical Technique Manual: Level II Upper Quadrant (2010). Pg 28-30.